An ambitious scientific experiment wreaks horrendous toll in the Booker-winning British author’s disturbingly eloquent sixth novel (after When We Were Orphans, 2000). Ishiguro’s narrator, identified only as Kath(y) H., speaks to us as a 31-year-old social worker of sorts, who’s completing her tenure as a “carer,” prior to becoming herself one of the “donors” whom she visits at various “recovery centers.” The setting is “England, late 1990s”—more than two decades after Kath was raised at a rural private school (Hailsham) whose students, all children of unspecified parentage, were sheltered, encouraged to develop their intellectual and especially artistic capabilities, and groomed to become donors. Visions of Brave New World and 1984 arise as Kath recalls in gradually and increasingly harrowing detail her friendships with fellow students Ruth and Tommy (the latter a sweet, though distractible boy prone to irrational temper tantrums), their “graduation” from Hailsham and years of comparative independence at a remote halfway house (the Cottages), the painful outcome of Ruth’s breakup with Tommy (whom Kath also loves), and the discovery the adult Kath and Tommy make when (while seeking a “deferral” from carer or donor status) they seek out Hailsham’s chastened “guardians” and receive confirmation of the limits long since placed on them. 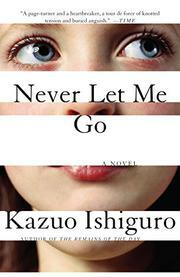 With perfect pacing and infinite subtlety, Ishiguro reveals exactly as much as we need to know about how efforts to regulate the future through genetic engineering create, control, then emotionlessly destroy very real, very human lives—without ever showing us the faces of the culpable, who have “tried to convince themselves. . . . That you were less than human, so it didn’t matter.” That this stunningly brilliant fiction echoes Caryl Churchill’s superb play A Number and Margaret Atwood’s celebrated dystopian novels in no way diminishes its originality and power. A masterpiece of craftsmanship that offers an unparalleled emotional experience. Send a copy to the Swedish Academy.